Gold Prospectors Association of America: The GPAA will hold its Gold and Treasure Show in Boise, Idaho April 11-12. Learn how to mine and pan for real gold from experienced gold prospectors at this event, which is open to the public. GPAA Gold and Treasure Expo attendees learn to pan for real gold! Another highlight is the ever-popular Alaska Gold Expedition prize giveaways. Two trips will be given away at each weekend show — one at the end of each day. Each trip is good for one person for two weeks and includes airfare to Nome, Alaska. America Gold and Treasure Shows. The fifth show of 2015 will be held April 11-12 in Boise, Idaho at Expo Idaho, 5610 Glenwood St. Boise, ID 83714. Learn how to prospect and pan for real gold from experienced gold prospectors. The GPAA Gold and Treasure Shows, which are open to the public, were started decades ago by GPAA founder George Massie to introduce people to gold prospecting and to teach them how and where to find their own gold. Besides being a lot of fun, the purpose of the gold shows is to remind everyone that gold prospecting and small-scale gold mining are still a way of life for hundreds of thousands of people across the United States. Gold mining is an integral part of American culture, heritage, our world history and our economy. “We invite everyone to bring their friends and family to the gold shows because there’s just no better place to learn how to and where to find your own gold than one of our events. Come out and experience gold panning. It’s fun for all ages,” said GPAA President Brandon Johnson. 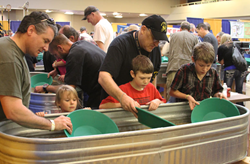 One of the most popular attractions at the Gold and Treasure Shows is the complimentary GPAA Gold Panning Zone, where all attendees can experience gold panning using real gold. Gold prospecting has become increasingly popular in the last few years with spiking gold prices. The growing interest in gold is reflected in not only the longest-airing prospecting TV show, “Gold Fever,” but several gold mining reality TV programs and the all new GPAA-produced show, “Gold Trails” with host Kevin Hoagland, who will be at the GPAA Gold and Treasure Show in Boise and eager to meet his new audience. The premiere episode of “Gold Trails” aired Jan. 3. To catch up on the series and watch all the previous episodes, go to http://www.goldprospectors.org/goldtrails. As well, look for reality TV celebrities from other gold mining shows who may be at the Boise show. For decades, the GPAA has been traveling across the U.S. with some of the most well-known and trusted prospecting and mining equipment dealers, giving people interested in gold prospecting an opportunity to learn about the products that will benefit them the most in the field. The event will feature prospecting and mining seminars led by Hoagland and other seasoned gold prospectors. Topics will include basic metal detecting, basic prospecting and local gold geology on Saturday and advanced metal detecting, prospecting tips and techniques and gold geology on Sunday. Winning ticket holders and others who decide to sign up for the Alaska Gold Expedition will visit the GPAA’s famous Cripple River Mining Camp, a popular summer prospecting destination on the shores of the Bering Sea, 12 miles from Nome. The 2,300-acre property and camp offers the best in gold prospecting adventures. “All Gold and Treasure Show attendees over 18 years of age have an opportunity to win this once-in-a-lifetime, unforgettable adventure to the home of Alaska Gold Rush. With admission, showgoers are given a raffle ticket for the drawing to be held at the end of each day of each show,” Johnson said. More than $15,000 worth of prizes, including metal detectors, sluice boxes and concentrators, will be given away to lucky ticket holders in the major prize raffle. The Gold and Treasure Show in Boise will be hosted by the local GPAA chapter in Nampa, Idaho. Local GPAA chapters are often invited by schools, Boy Scouts and Girl Scouts, other youth groups and organizers of local fairs and community events to demonstrate gold panning and share their knowledge of gold mining history and heritage. Showgoers who feel the gold bug bite are invited to visit the GPAA booth, and join our community for treatment. There are many GPAA mining claims in the area to explore with your friends and family, or with a local GPAA Chapter after the show. Nationally, the GPAA has more than 350 mining claims where members can prospect and mine for their own gold. The gold is yours to find and keep. Those who come down with really a bad case of gold fever and may want to experience a real mining camp are also invited to stop by the GPAA booth to explore what the Lost Dutchman’s Mining Association has to offer. While there is no cure for gold fever, LDMA mining camps are the best known remedy. The major prize raffle is sponsored by Summit Mining & Equipment, Inc., Martin Prospecting Equipment, Royal Manufacturing, Gold Cube, Garrett, Felix Paydirt, Keene Engineering, Inc., Fisher Metal Detectors and the Gold Prospectors Association of America. “For those who prefer to buy gold or jewelry rather than find it themselves, there will be plenty of opportunity for that as well,” Johnson said.